Here are the details for the GSGB events for 2018 - makes your mouth water eh? While steeped in history, Prince's Golf Club offers all that is best in modern championship links golf in an idyllic coastal setting. A host of Local Final Qualifying for The Open Championship from 2018 to 2022, Prince's also co-hosted The Amateur Championship in 2013 and 2017. Prince's Golf Club have 27 Holes, practice facilities and a centrally located clubhouse. Helpful, attentive and informative staff are on hand to cater for your needs. Fourballs, groups, company days and society bookings are accepted 7 days a week, subject to availability. We are happy to arrange meals and snacks to suit your needs. At the beginning of the last century, Sir Harry Mallaby – Deeley, founder and first President of Prince’s Mitcham and a regular golfing visitor to East Kent, decided to establish a new Links at Sandwich that would, in particular, welcome lady, junior and family golfers. With his Cambridge University friend Percy Montagu Lucas he put up most of the capital for the enterprise, the land being donated by the Earl of Guilford. Charles Hutchings, the 1902 Amateur Champion, was engaged as architect and he and Percy laid out the course in 1904. It was completed late in 1906, P M Lucas became the club’s first Secretary and A.J. Balfour (Prime minister 1902-05) drove the first ball as Club Captain in the Founder’s Vase in the following June. The new course was the first designed to counter the new Haskell ball and at just under 7000 yards was enthusiastically received by the golfing fraternity. Royal Cinque Ports Golf Club is a Members' Club with an 18 hole Championship Links golf course,regarded by many as one of the finest in the world. The Club also has excellent practice facilities,including a driving range, putting green, chipping green and pitching greens. The Club has been the scene of many Championships, including two Open Championships in 1909 and 1920. The Club hosted the Amateur Championship in 2013 and is one of four Final Open Qualifying venues from 2014-2017. Royal Cinque Ports Golf Club is a Club steeped in history. In 120 years the Club has evolved from a 9 hole course in to the 18 hole Championship Links venue that exists today. If you would like to read about the Club's history in further detail you can purchase the book 'England's Finest Links: History of Royal Cinque Ports'. Details are available by clicking here. 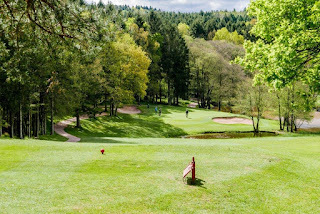 Nestling in the wooded hills above the Wye Valley between Ross on Wye, Ledbury and Newent, The Ross on Wye Golf Club is one of the finest courses in the South West Midlands and is something of a Hidden Gem. Rolling fairways lined with mature stands of trees mean that accuracy and course management are at a premium rather than just length of hitting. 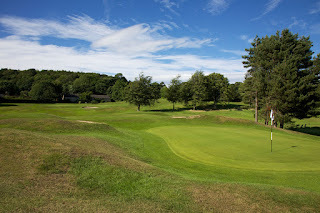 The beautiful Herefordshire countryside makes this a relaxing, friendly and picturesque place to play golf in any season but be too aggressive and the course will bite back – hard. Designed by the leading architect Ken Cotton in the early 1960's, the club is now advised by another outstanding course architect, Donald Steel - the architect for many famous courses including the redesign to championship standard of the Jubilee Course at St. Andrews. Sympathetically laid out to follow the natural contours of the hills “The Ross on Wye Golf Club” is a haven for wildlife. Wild daffodils and bluebells carpet the woods in springtime and the autumn leaves are worth the walk on their own. Expect the company of numerous squirrels and look out for the buzzards regularly circling overhead, and, if you are really lucky you may see the odd Muntjac deer. The Rolls of Monmouth Golf Club, with its championship 6,733 yard golf course, is set in superb countryside with spectacular views of the Welsh hills. 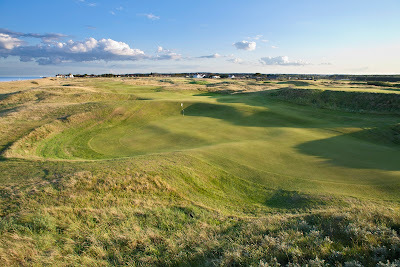 It is one of the most outstanding golf courses, not just in Wales, but in the whole of the UK. The Hendre House, originally a hunting lodge (or ‘box’ as it was called) dates back over three hundred years. It was in the ownership of the Rolls family from 1767 until 1987. The Rolls family enlarged the old house in several stages over the following decades using three famous architects, starting with George Vaughan Maddox who rebuilt parts of the south wing in 1830. He was followed by Thomas Henry Wyatt who continued the enlargement of the south wing both to the east and to the west during the period 1837 and 1858. In 1872 he pulled down the old stables and built the present Coach House and loose boxes which for that period were very modern and forward looking. Also at this time the centre of the present house, being the Billiard Room, Smoking Room and Dining Room, were added. The third architect was Aston Webb, well known for his work on Buckingham Palace, who added the great cedar Library wing in 1896. Many famous people were entertained here during this latter period including the Duke and Duchess of York who later became King George V and Queen Mary. In 1910, the most famous son of the Rolls family, Charles Stewart Rolls was killed in a flying accident. The Belfry has become synonymous with golf and is a Mecca for both professional and amateur players. Located just outside of Birmingham, our golf courses are easy to access and attract players from across the UK and further afield. Host to more Ryder Cup matches than any other venue in the world, and steeped in tournament history, our three stunning courses, sculpted from acres of lush North Warwickshire countryside, have provoked some of the most dramatic moments in the history of the sport. The majestic fairways and carpet-smooth greens of The Brabazon form a world-famous stage on which some of golf’s most exhilarating dramas have played out. Sam Torrance’s famous putt that won the 1985 Ryder Cup match for the European Team or Christie O’Connor Jr’s belligerent 2 iron across the lake at the 18th. More recent changes have seen the 6th hole become one of the most demanding, rated highly by modern-day great Lee Westwood. The PGA National, having hosted two European Tour events, is one of the West Midlands’ finest golf courses, and fast becoming one of the top courses in the United Kingdom. Recognised by the PGA as a world-class tournament course and the only PGA branded course in England, the PGA National is a must for golfers who enjoy the creativity and shot-making required for links golf. 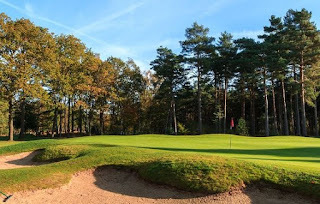 Camberley Heath Golf Club was founded in 1913 and beautifully designed by Harry Colt. 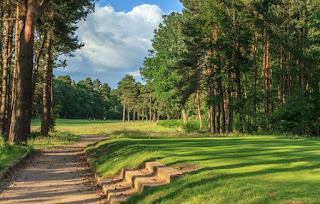 Camberley Heath is a 6,426 yard & 71 par golf course, challenging all handicaps. A challenging golf course that features an abundance of pine and heather. 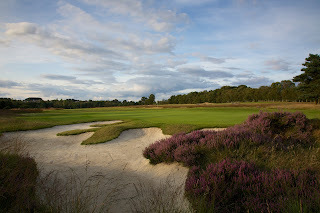 A true classic amongst heathland golf courses. 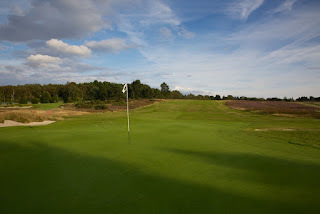 Harry S. Colt designed an outstanding heathland course, where natural contours have been used to enhance the "strategic golf experience". Established in 1913, the opening drive was taken by HRH Prince Albert of Schleswig Holstein. Which would undoubtedly convince you to visit. Farnborough and Aldershot. It has a par of 71 and features three par three and two par five holes. The par threes, the shortest of which is 168 yards, are a particular challenge for most golfers. Measuring 6,550 yards from the white tees, our course is one of the longest golf courses in this area although the fairly level terrain means it remains a comfortable walk for most players. 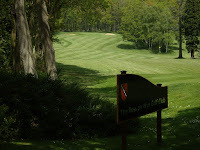 Today's course layout was established in the 1960's and during the summer the greens are reputed as being among the best in Hampshire. Mature trees and rhododendrons border many of the shaped fairways and provide a blaze of colour in the spring. Groups of small deer can frequently be seen quietly observing play from woodland clearings adjacent to the fairways. Bridges, each bearing the cap badge of regiments, span ditches that provide attractive features. These ditches ensure, that surplus rainfall is dispatched efficiently allowing the fairways to remain firm and playable. 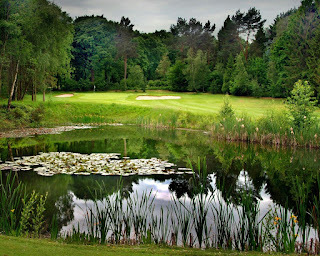 The first hole is a fairly straight-forward par 5 running alongside the Basingstoke Canal. The following two holes allow you to settle into your game before rising to take on a mixture of challenging holes from four through to fourteen. Our halfway house provides an ideal place to pick up some refreshments during a round. The fifteenth hole is now identified as the "signature hole" of the Army course. Beautifully remodelled in 2001 it features a stream flowing between well-supported banks in front of a forward sloping green. From any tee positions two solid, well-placed shots are needed to reach the green. The final four holes provide a demanding finish for even the most accomplished player. The eighteenth features a large two-tiered green, rebuilt in 2003, requiring skill and concentration to read the borrows and avoid that dreaded three putt! Founded in 1909, Moortown was designed by the World famous golf course architect Dr Alister MacKenzie, who also designed Augusta National, Cypress Point, Royal Melbourne and many other championship courses throughout the world. 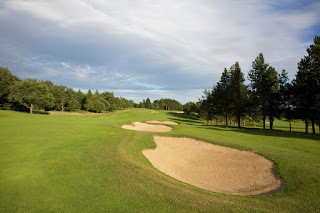 Well-known around the World as the host of the first Ryder Cup match on British soil, in 1929, Moortown is regarded by many as one of the Country’s finest inland golf courses. 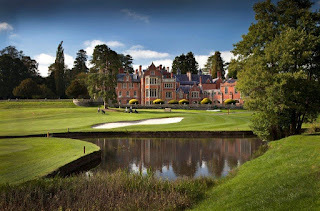 Over the past Century the Club has hosted many professional and amateur tournaments with winners that include Sir Nick Faldo, Bernard Gallagher and Sir Michael Bonallack, former Captain of the R & A, to name but a few. 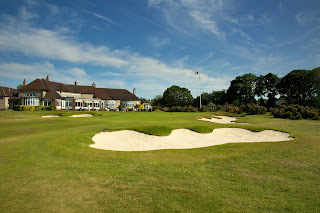 Today Moortown Golf Club prides itself on the warm welcome afforded to local, national and international Visitors alike. Although steeped in history, the Club provides a range of modern facilities including our magnificent warm-up facility which visiting golfers can enjoy prior to their round. The Bradford Golf Club is one of the oldest and most prestigious golf clubs in Yorkshire. Established at Baildon in 1891 as The Bradford St Andrews Golf Club, the club changed its name in 1894 and was relocated to its present site in 1899. The original Clubhouse was opened on 9th November 1900 by the Rt. Hon. A.J. Balfour MP, Leader of the House of Commons and Prime Minister (1902-05). In 1925 it was destroyed by fire and rebuilt on the same foundations. In 1922/23 the course was substantially altered by the golf architects Messrs. Fowler and Simpson. They made the layout similar to the course you see today and we are proud of being one of only two Fowler-designated courses in Yorkshire. The course has been further improved with significant investment in greenkeeping equipment, alterations to the drainage and the construction of new bunkers. In more recent times, we have embarked on a course development programme to ensure that the course continues to retain its open moorland aspect and unique features of Fowler's original design. Re-laid out in 1923, our Herbert Fowler-designed Par 71 Championship Course is one of the oldest in Yorkshire and provides a real challenge for golfers of all handicaps. 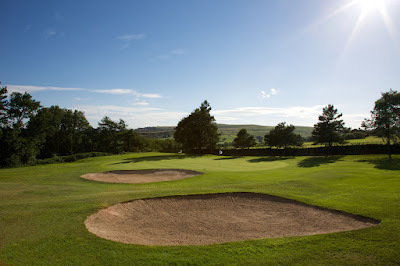 The course is a moorland links which commands stunning views over Baildon and Rombald Moors. It runs in two natural loops with the 10th and 18th holes finishing outside the Clubhouse. Many holes are played along well-defined, tree-lined fairways to fast and testing greens with subtle borrows. Always in immaculate condition, the course has recently undergone a significant £1 million improvement programme to ensure that it remains pristine and playable throughout the seasons in all but the most adverse weather conditions. We are the home of The Hawksworth Trophy, a prestgious 36-hole medal-play competition for the leading amateur golfers in Northern England and the course continues to be used for many prestigious Yorkshire Championship events.